Kumihimo is an ancient braiding technique, commonly used by the Japanese. 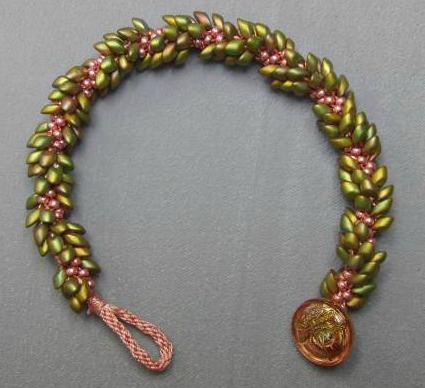 Traditionally made with cording, being a bead shop, we had to use beads! You will need a Kumihimo disk, spoolies, and a weight to go along with your beads. Learn the basic 8-strand braid! 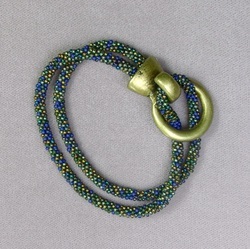 We use 8/0 seed beads, 3mm cubes, 4x3mm rondelles, drops; if it fits on the C-lon cording, why not? This makes a great bangle! 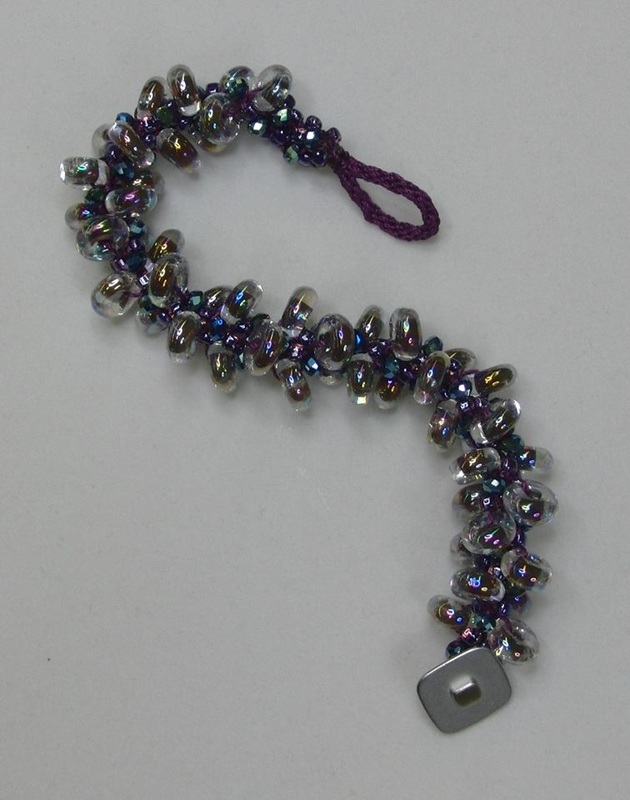 Learn Kumihimo with Beads and Byzantine Chain Maille in the same class. Maria is teaching this class with 12 strands of leather ... we love it! Using 1mm leather and very few beads, create this unique version of Kumihimo. This braid has twelve strands (instead of our usual eight). 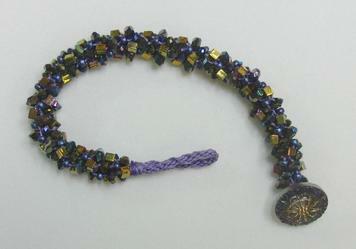 This is a wonderful necklace made with hand-made Unicorne drop beads. 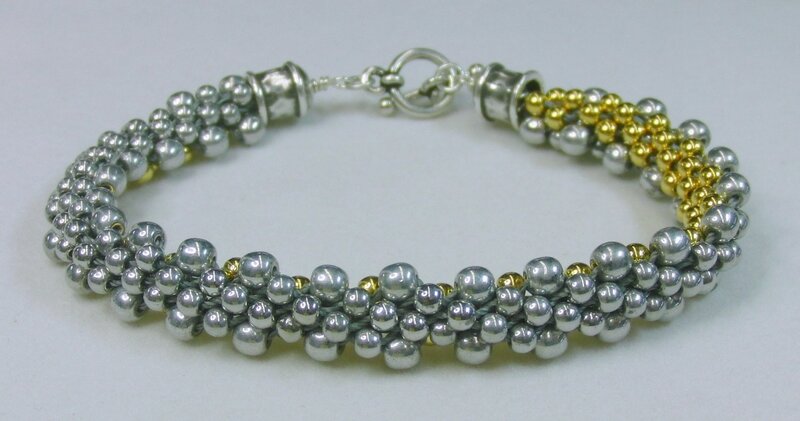 Learn to figure out the counts to position your beads where you want them! Virtually everyone who tries Kumihimo loves it. It's so different than bead weaving ... eight strands are braided together with the help of a Kumihimo disc ... we can help guide you to greatness! 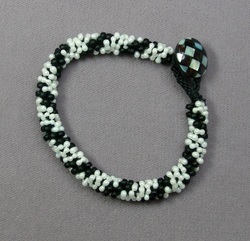 Designed to look like a "Dovera" bracelet ... only with Kumihimo instead of bead crochet! This braid is pretty flat because of the larger side beads.